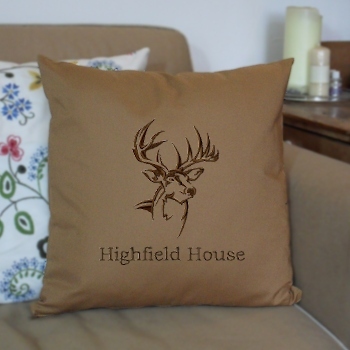 Approx 41cm or 16 inch square 100% cotton cushion cover in mocha brown colour. Select the font style you prefer. Enter a name, or couple's names, nicknames, house name or even your postcode. Beautifully sewn in a thread colour of your choice to make a fantastic Personalised cushion.